Are You Just A Little Bit Sick And Tired Of Failing Your Driving Test? It is a horrible feeling to keep failing, your confidence goes and you start to doubt yourself, but we have a special course to help you pass your driving test. You have failed your driving test with your last driving school and you no longer believe your driving instructor has got what it takes to help you get your driving licence in Oxford. In fact you may have lost total motivation and have started to think that learning to drive is a chore and certainly it has lost its fun. What you need is a special driving test rescue course which gives you the preparation and skills to pass your driving test? Failing your driving test is no accident, it was because you were not 100% ready and because you were not ready and you had never proved to yourself you were ready you never had the confidence needed to pass. Your driving examiner is looking for three aspects from your driving, yes they want to see you drive safe, but also you need to be in control of the car at all times and aware of your surroundings. Many school forget to tell you that! We are going to start you off by re-booking in your test during your first lesson of the rescue course and we are going to see how well you drive. All the good points you have in your driving will be used as a foundation to catapult your skills and confidence into a position where you know you are going to pass. There will be no uncertainty. You will walk into your newt driving test knowing you have the skills and you can actually enjoy driving the examiner around the test route. I do not think you are that far away from this level of driving, and it is with this preparation you will go into your driving test and come out with your full driving licence in Oxford. 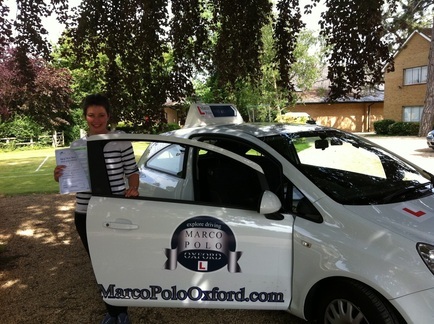 At Marco Polo Oxford Driving School we have helped many people like you so do the best thing you can and phone us today.